My best friend and my namesake has been complaining for quite sometime that Ive been posting mainly recipes of sweet dishes and has been pestering me to post recipes of some savory items. So i decided to make Pindi Channa. 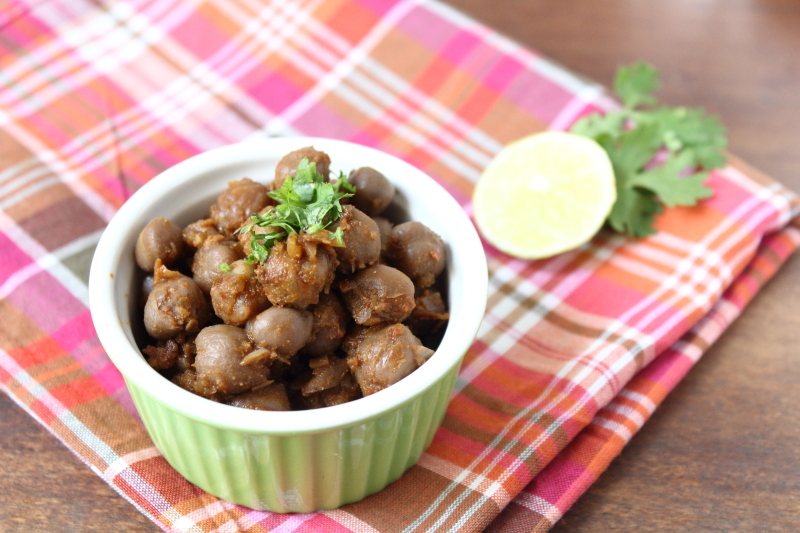 Pindi Channa, a dry dish made from chickpeas, has its roots in Rawalpindi (Pakistan), hence the name. There are several versions of this dish including the ones which do not use onions and tomatoes. I learnt this dish from my aunt who has lived more than 20 years in the northern parts of India. She is the family expert on making north Indian delicacies. At the risk of sounding cliched i should say that I found Pindi Channa very easy to prepare. Coarsely grind the same the spices and keep it aside. Place the tea powder, cardamom, cinnamon and cloves on a piece of cloth and tie it up. Place this along with the soaked chickpeas (with the water) & salt in a vessel and pressure cook it till it is soft. This ensures that the flavour of the whole spices and color of the tea is infused in the chickpeas. Heat a pan and add the oil and ghee. Fry the onions and ginger till it is brown in colour. Now add the tomatoes and fry till it gets pulpy and has blended well with onions. At this stage add the dry roasted spices, chickpeas, salt and about ¾ cup of the water that was used to cook the chickpeas. Fry this for about 2-3 mins and then pressure cook the chickpea mixture for about 5 mins. This ensures that the spices are well infused into the chickpeas. Before serving, add the juice of 1 medium sized lime to the chickpea curry and mix well. Garnish with coriander leaves, chopped onions and green chillies. Serve hot with Indian breads like baturas and puris !! You can use tea bags instead of tea powder. In that case add the whole spices directly with the chickpeas in the pressure cooker. Ash u r getting better at photography:).Recipe looks good.Will try soon..